QRG - Quick Reference Guide. Operation Manual - Correct operation of the various functions. 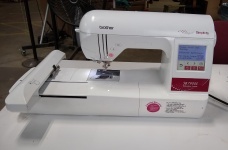 USB Manual - Descriptions for transferring embroidery patterns from USB media to the machine. File types supported: pes, dst and pen files. Pen are from Brother's Ibroidery site and cost money. This page was last modified on 1 March 2019, at 17:43.